This should be the last mention of Bryant Park on this site for a while, don’t you think? But since the park’s locked gates were an item on Sunday and Tuesday, it’s only fair to report that the gates are open again now. Having driven in, a few people were in the 100-year-old Albany park on Tuesday afternoon. Though I didn’t need the gates to be open for this, I took a quick turn around the place on the bike. One thing worth noting is that the parks department has prepared the parking lots for the new year. They looked covered with new gravel. 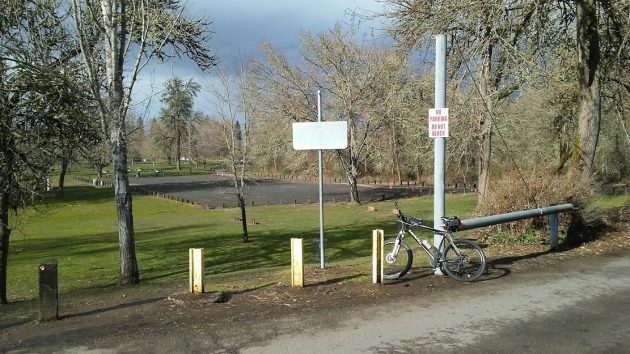 The park had been closed to motor traffic on Feb. 25 in anticipation of high water in the Willamette and Calapooia rivers. Unlike in past winters, no major flooding materialized. And now, the chance of the park being inundated has greatly diminished, though a sudden thaw in the Cascades along with a big rainstorm could change that. Incorporating video to lend support to your penetrating reports is to be commended. Yup, I agree. If this was a commercial enterprise, it would invest in proper equipment including a steady-cam. Hasso the other 99.9% of your readers really appreciate all of your efforts. Keep up the good work! I appreciate any info you give us about park conditions in the city. Generally sad shape. How about Burkhart Square next to the Albany Civic Theatre on First Street? It is really embarrassing for the downtown area to see knee high + weeds in the square! I feel sad for the Burkhart Family having to see their family name on such a mess.